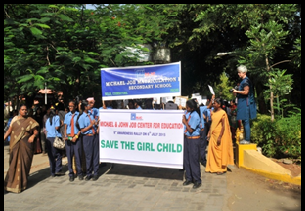 This year as a part of its public awareness program MJC organized a rally with the message “SAVE THE GIRL CHILD” on Monday 6th July, 2014 at Race Course, Coimbatore. Around 500 students from MJC along with Patrons and the Staff of our Educational Institutions participated in this Rally. A group of students from Indian Public School, Coimbatore also joined our Rally this year. The rally started from Sarathambal Temple in Race Course area and ended at the same place. 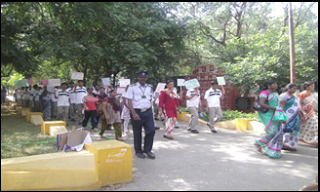 There was a good response from the public to who joined us in support the theme of our rally. For MJC such initiatives are part of their learning and they organize such programs every year with participation form MJC students, faculty and well-wishers in conjunction with their convocation ceremony. 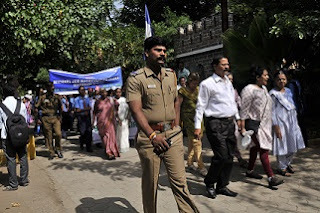 In the past they had many local dignitaries like Late Hema Karunakaran (former Commissioner of Police) and Mr Doraiswami a leading political personality blessing these initiatives. The trustees of the institutions, the three principals, the staff and students took part in the rally this year. Children raised slogans urging the people to give education to the girl children and they also highlighted the negative effects of female foeticide and female infanticide. The importance of girl child was recited in the form of rhymes. Enthusiasm of the local community could be seen by their presence and served as a boost for the cause. 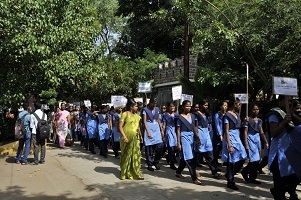 The participants in the rally also had placards with different slogans in local language depicting the importance of girl child in the society to spread awareness in the society and remove differences between boys and girls from public mind. . Reporters from varies dallies had come and noted about the rally.